Former London Mayor Ken Livingstone claims Hitler only 'ended up' killing Jews after 'going mad', says no anti-Semitism in his party. The anti-Semitism scandal that never ends: By now it seems that hardly a day goes by without another anti-Semitism scandal rocking the UK Labour Party. Indeed, just one day after MP Naz Shah was suspended for calling for the mass-deportation of Israeli Jews to America (among other anti-Semitic statements she posted online), a senior party figure close to leader Jeremy Corbyn has publicly backed her - and claimed that Adolf Hitler was "supporting Zionism" for good measure. Ken Livingstone is no stranger to anti-Semitism himself. The former London Mayor once compared a Jewish reporter to a concentration camp guard, forged a close friendship with the deeply anti-Semitic (and homophobic) Muslim hate preacher Yousef al-Qaradawi, and infamously claimed British Jews don't vote for Labour because they're all "rich." But Ken has repeatedly denied being anti-Semitic himself and is now defending Shah, whose comments he insists were "over the top, but not anti-Semitic." Apparently blind to the scandals buffeting his party, Livingstone claimed in a BBC interview on Thursday morning that in his many decades in Labour he had never witnessed any evidence of anti-Semitism. Relating to Shah's comments - which she herself has acknowledged were anti-Semitic - he appeared to justify calls for ethnically-cleansing Jews from Israel by claiming... that Nazi leader Adolf Hitler "supported Zionism." He also appeared to play down the premeditated nature of the Holocaust, claiming that Hitler only "ended up" committing genocide after "going mad." 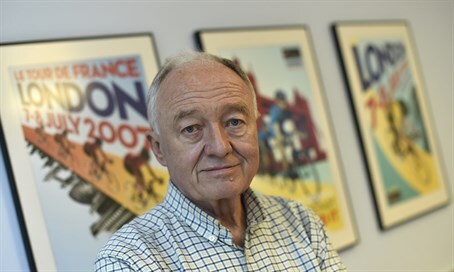 "When Hitler won his election in 1932 his policy then was that Jews should be moved to Israel," Livingstone said. "He was supporting Zionism... before he went mad and ended up killing 6 million Jews." Indeed the Nazi Party initially considered several measures to ethnically-cleanse Jews from its borders - including the mass-expulsion of Jews to Madagascar or what was then British Mandate Palestine - before those plans were rejected in favor of a campaign of systematic genocide. But the allegations that he was doing so as a "supporter of Zionism" - as opposed to a racial supremacist murderer - echo some of the worst anti-Semitic conspiracy theories often aired by elements of both the far-left and far-right; namely that Jews are somehow responsible for their own murders during the Holocaust. He then further defended Shah's hateful rhetoric, by saying she was right to be angry over Israel's battle against terrorists in Gaza. "The simple fact in all of this is that Naz made these comments at a time when there was another brutal Israeli attack on the Palestinians," he said. Anti-Semitism campaigners have often warned that anti-Semitic hate crimes tend to spike sharply during escalations in the Arab-Israeli conflict - in part due to the tendency of figures on the political left expressing similar statements justifying such acts as understandable forms of protest. As for the string of anti-Semitism allegations against his party, Livingstone again blamed (you guessed it) a Jewish conspiracy, dismissing Jewish concerns as part of a "pro-Israel" propaganda campaign. "There's been a very well-orchestrated campaign by the Israel lobby to smear anybody who criticized Israeli policies as anti-Semitic," he said, brushing aside the accusations. Reacting to his comments, several fellow Labour party officials issued swift condemnations - some even calling for Livingstone to be expelled. Labour's current Mayoral Election candidate Sadiq Khan tweeted: "Ken Livingstone's comments are appalling and inexcusable. There must be no place for this in our Party." Labour MP Jess Phillips called for Livinstone's immediate suspension, while MP Wes Streeting tweeted: "Please tell me this is satire and didn't actually happen?" But happen it did - and for what will certainly not be the last time.